It might not be the first thing that springs to mind when imagining how your new retail space is going to look, but the flooring is possibly one of the most important. Not only is it a necessary consideration for health and safety but it can also serve as a calling card for your business. You only need to glance at Instagram and you’re bound to see at least one image of someone’s feet on a pretty floor and there’s even articles in interior magazines focusing solely on the best retail floors of the moment. Here are some of the benefits of choosing concrete over other flooring options. Firstly you need to eradicate that preconception that it’ll be grey, dull and cold because concrete flooring is really versatile and there are numerous styles out there. 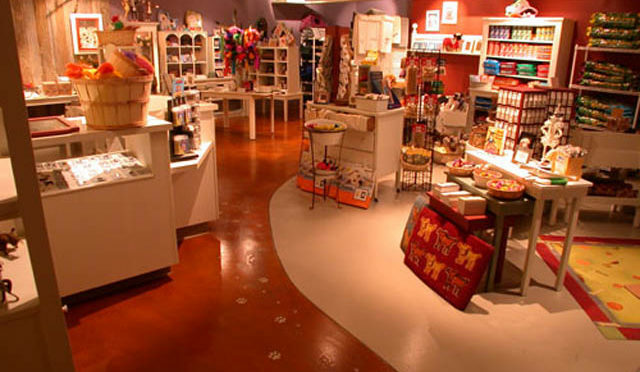 Decorative concrete floors are becoming more and more commonplace in commercial and retail facilities because they provide a uniqueness and sophistication. There are loads of options from stencils, various colors and it can even be made to mimic marble at a much more affordable price than the real thing! Concrete is being used by architects and designers worldwide in residential and commercial work. The effect that can be achieved is often show-stopping and spectacular like the work of architects such as Peter Marino. It doesn’t have to be limited to the floor either as most companies can make concrete countertops, bars and even furniture. Concrete flooring is much easier to clean and maintain than many other floor surfaces which is vital when there are areas which will receive a lot of foot traffic. However, this doesn’t mean that they don’t require any maintenance. Although the contractors will have sealed the floors to protect them they will still need regular cleaning or polishing to keep them looking their best. Some contractors will offer periodic site visits. If you’re unsure about what style would suit your store and can’t afford to hire a designer or architect, then look for a contractor who will advise as well as install. Many concrete contractors have years of experience and knowledge and will know what styles suit certain areas or retail markets best. They will often begin the creative process by asking questions about your business, goals and budget and then they will create a concept and samples based on your needs and vision. They can advise you on layout, color and composition as well as products and installation. The important thing to consider before choosing to have a concrete floor is the specific requirements you need it to fit with whether that’s for it to stand up to heavy foot traffic, be heat resistant, easy to clean or highly decorative. It’s a good idea to visit a few showrooms to see the quality and choices firsthand and get as much advice as you can before you make a decision. All-in-all, whatever your business, a concrete floor will offer long-term durability and can be a great business investment.